The finance industry is being disrupted in a big way by emerging technologies like artificial intelligence, machine learning, blockchain technology, and big data. Despite these advances, the industry continues to lag behind, slow to incorporate new technology into their business practices. But there are signals that some of the larger players are beginning to explore methods for renovating their archaic processes. While tech "unicorns" coming out of Silicon Valley are starting to sound like a dime a dozen, the first tech unicorn to come out of Africa, Africa Internet Group (AIG), is causing a stir. Growing into a unicorn - a privately held technology company valued at $1 billion or more - is a significant milestone for AIG, says Wharton management professor David Hsu. Founded in 1857, BBVA has been dedicated to innovation in the global financial ecosystem for almost 160 years already and the upcoming BBVA Open Talent 2016 is a proof of that commitment. If we were to list the most innovative banks internationally, BBVA would be the most progressive financial institutions to name. 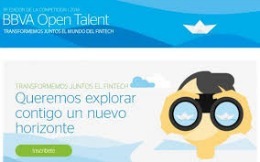 Founded in 1857, BBVA has been dedicated to innovation in the global financial ecosystem for almost 160 years already and the upcoming BBVA Open Talent 2016 is a proof of that commitment.